Jo Kuffour's excellent hat-trick helped Bristol Rovers seal a thrilling nine-goal game in the area quarter-finals of the Johnstone's Paint Trophy. The striker headed in early on before exposing Wycombe's offside trap. Scott Rendell then headed home for Wanderers before further strikes from Kuffour and Chris Lines and a Jeff Hughes penalty sealed Rovers' win. Rendell sealed his own treble with a penalty and a late header, before Ben Swallow fired in the visitors' sixth. Wycombe came out at the start of the second half all guns blazing and Rendell's fine finish from Ben Strevens' cross looked to have given them a fighting chance. But their defence could not deal with the pace of Kuffour, who completed his hat-trick and the home side's off-form back-line fell apart with Lines finishing from Hughes' ball. Alan Bennett fouled Kuffour as Hughes fired home the penalty to grab Rovers' fifth. The hosts kept battling away with Rendell completing an excellent hat-trick, as he fired home from the spot after being fouled by Lines before nodding in Matt Bloomfield's cross. Swallow then caught Wycombe on the break to add Rovers' sixth and seal an impressive away victory. "Defensively it wasn't our best performance. With the attacking threat they've got, opportunities came and they took them. "It's an incredible scoreline, it just goes to show we can score goals. "But it shows that defensively tonight we weren't good enough as individuals and as a unit." "The skipper (Stuart Campbell) immediately gave us the competitive edge that you look for, and others then followed suit. "He (Ben Swallow) showed a fantastic bit of quality for the goal but we have talked about his defensive duties as well. "It is a competition we're taking seriously and as it gets closer it gets more interesting." 94:27 The final whistle goes and the game is over. 90:00+3:39 The referee blows for offside. Free kick taken by Carl Regan. 90:00+1:43 GOAL - Ben Swallow:Wycombe 3 - 6 Bristol Rovers Ben Swallow finds the net with a goal from outside the penalty box to the top right corner of the goal. Wycombe 3-6 Bristol Rovers. 89:14 Matt Bloomfield concedes a free kick for a foul on Jo Kuffour. Jeff Hughes takes the free kick. 88:14 Assist by Matt Bloomfield. 88:14 GOAL - Scott Rendell:Wycombe 3 - 5 Bristol Rovers Scott Rendell finds the back of the net with a headed goal from deep inside the penalty area. Wycombe 3-5 Bristol Rovers. 87:18 Jo Kuffour is flagged offside by the assistant referee. Free kick taken by Nikki Bull. Stuart Campbell gives away a free kick for an unfair challenge on Scott Rendell. Matt Bloomfield takes the free kick. 82:59 Unfair challenge on Kieran Murtagh by Eliot Richards results in a free kick. Matt Bloomfield takes the free kick. 82:23 Matt Bloomfield takes the inswinging corner, Chris Lines gives away a Penalty for an unfair challenge on Scott Rendell. 82:23 GOAL - Scott Rendell:Wycombe 2 - 5 Bristol Rovers Scott Rendell scores a penalty. Wycombe 2-5 Bristol Rovers. 80:08 Kadeem Harris sends in a cross, clearance made by Carl Regan. 79:03 Substitution James Tunnicliffe joins the action as a substitute, replacing Danny Coles. 78:31 Substitution Eliot Richards replaces John Akinde. 77:21 Stuart Campbell concedes a free kick for a foul on Scott Rendell. Free kick taken by Matt Bloomfield. 76:04 Penalty awarded for a foul by Alan Bennett on Jo Kuffour. 76:04 GOAL - Jeff Hughes:Wycombe 1 - 5 Bristol Rovers Penalty scored by Jeff Hughes. 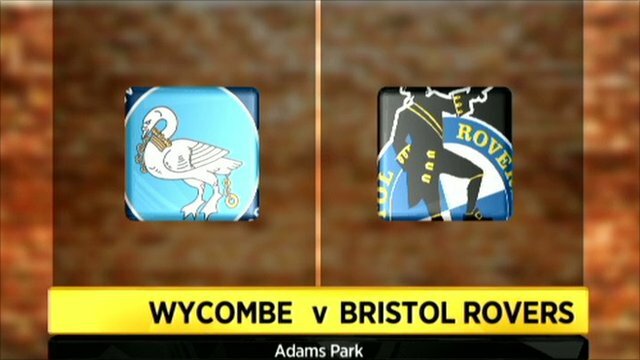 Wycombe 1-5 Bristol Rovers. 72:24 Matt Bloomfield takes the outswinging corner, clearance made by John Akinde. 71:19 Corner taken by Matt Bloomfield played to the near post, Gary Sawyer makes a clearance. 71:07 Danny Foster produces a cross, Gary Sawyer makes a clearance. 70:23 Chris Lines gives away a free kick for an unfair challenge on Matt Bloomfield. Matt Bloomfield takes the free kick. 69:18 Kevin Betsy produces a right-footed shot from deep inside the area which goes wide of the left-hand post. 69:02 Marvin McCoy produces a cross, Ben Swallow manages to make a clearance. 64:23 Substitution (Bristol Rovers) makes a substitution, with Ben Swallow coming on for Wayne Brown. 64:23 Substitution Stuart Beavon leaves the field to be replaced by Matt McClure. 64:23 Substitution Ben Strevens leaves the field to be replaced by Kadeem Harris. 63:57 Corner taken by Matt Bloomfield from the right by-line played to the near post, Wayne Brown makes a clearance. 62:46 Booking Chris Lines is given a yellow card. 61:42 Jeff Hughes provided the assist for the goal. 61:42 GOAL - Chris Lines:Wycombe 1 - 4 Bristol Rovers Chris Lines gets on the score sheet with a goal from just inside the area to the bottom left corner of the goal. Wycombe 1-4 Bristol Rovers. 58:36 John Akinde provided the assist for the goal. 58:36 GOAL - Jo Kuffour:Wycombe 1 - 3 Bristol Rovers Goal scored by Jo Kuffour from the edge of the penalty box to the bottom right corner of the goal. Wycombe 1-3 Bristol Rovers. 57:43 Assist on the goal came from Ben Strevens. 57:43 GOAL - Scott Rendell:Wycombe 1 - 2 Bristol Rovers Scott Rendell scores a headed goal from deep inside the penalty box. Wycombe 1-2 Bristol Rovers. 56:24 The ball is crossed by Kevin Betsy, Wayne Brown manages to make a clearance. 55:07 Danny Coles gives away a free kick for an unfair challenge on Ben Strevens. Direct free kick taken by Kieran Murtagh. 53:59 Scott Rendell concedes a free kick for a foul on Gary Sawyer. Mikkel Andersen takes the direct free kick. 53:22 Corner taken by Matt Bloomfield. 51:25 Stuart Beavon produces a cross, Mikkel Andersen makes a comfortable save. 47:54 Unfair challenge on Scott Rendell by Danny Coles results in a free kick. Scott Rendell takes the free kick. 47:27 Jo Kuffour takes a shot. Save made by Nikki Bull. 47:03 Free kick awarded for an unfair challenge on Wayne Brown by Stuart Beavon. Wayne Brown restarts play with the free kick. 45:00+1:13 It is the end of the first-half. 44:43 The ball is delivered by Stuart Beavon, save made by Mikkel Andersen. 44:28 John Akinde is flagged offside by the assistant referee. Nikki Bull takes the free kick. 43:29 Outswinging corner taken right-footed by Stuart Campbell from the right by-line, save by Nikki Bull. 39:58 GOAL - Jo Kuffour:Wycombe 0 - 2 Bristol Rovers Jo Kuffour grabs a goal from deep inside the penalty box to the top right corner of the goal. Wycombe 0-2 Bristol Rovers. 39:05 Chris Lines takes the outswinging corner, Leon Johnson manages to make a clearance. 33:23 Jeff Hughes crosses the ball, Effort from inside the penalty box by Wayne Brown strikes the post. 30:06 Unfair challenge on Stuart Beavon by Jeff Hughes results in a free kick. Direct free kick taken by Matt Bloomfield. 29:31 The ball is swung over by Marvin McCoy, save by Mikkel Andersen. 29:22 Kevin Betsy sends in a cross. 29:16 The ball is delivered by Marvin McCoy. 29:07 The ball is swung over by Marvin McCoy. 27:26 Charles Reece produces a right-footed shot from just inside the penalty box and strikes the post. 26:46 Free kick awarded for an unfair challenge on Gary Sawyer by Stuart Beavon. Mikkel Andersen takes the free kick. 25:48 The ball is sent over by Ben Strevens, Chris Lines makes a clearance. 25:05 Foul by Byron Anthony on Stuart Beavon, free kick awarded. Direct free kick taken by Danny Foster. 22:54 Stuart Beavon delivers the ball, Mikkel Andersen makes a comfortable save. 21:57 Gary Sawyer provided the assist for the goal. 21:57 GOAL - Jo Kuffour:Wycombe 0 - 1 Bristol Rovers Jo Kuffour scores a headed goal from inside the six-yard box. Wycombe 0-1 Bristol Rovers. 20:49 Matt Bloomfield takes a outswinging corner from the right by-line played to the near post. 19:27 Kevin Betsy is adjudged to have handled the ball. Direct free kick taken by Stuart Campbell. 18:48 Jo Kuffour fouled by Leon Johnson, the ref awards a free kick. Stuart Campbell takes the direct free kick. 18:22 The referee blows for offside. Nikki Bull restarts play with the free kick. 15:40 Chris Lines gives away a free kick for an unfair challenge on Matt Bloomfield. Direct free kick taken by Matt Bloomfield. 14:21 Kevin Betsy is flagged offside by the assistant referee. Direct free kick taken by Byron Anthony. 12:14 Free kick awarded for a foul by Jeff Hughes on Stuart Beavon. Matt Bloomfield takes the free kick. 12:00 The ball is swung over by Gary Sawyer, Leon Johnson makes a clearance. 7:05 Corner crossed in by Matt Bloomfield, free kick awarded for an unfair challenge on Danny Coles by Scott Rendell. Mikkel Andersen takes the direct free kick. 5:53 Outswinging corner taken right-footed by Matt Bloomfield from the right by-line, Byron Anthony fouled by Leon Johnson, the ref awards a free kick. Indirect free kick taken by Mikkel Andersen. 5:18 Matt Bloomfield takes a corner. 3:00 Leon Johnson fouled by John Akinde, the ref awards a free kick. Leon Johnson takes the direct free kick. 2:30 Free kick awarded for an unfair challenge on Stuart Campbell by Matt Bloomfield. Byron Anthony takes the free kick. 1:39 Effort from outside the area by Jo Kuffour goes wide right of the goal. 0:59 Stuart Campbell gives away a free kick for an unfair challenge on Kevin Betsy. Direct free kick taken by Danny Foster.